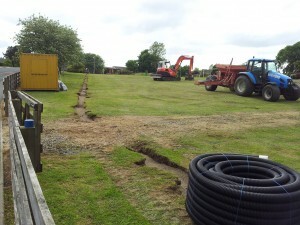 Long awaited work on the Braiklay Avenue Park drainage is under way this week. Contractors, Souters are digging a series of drainage channels and filling with sand to improve and dry out the park surfaces. Over the last few years the ground has become more and more boggy. The Community Council and Local Aberdeenshire Councillor Paul Johnston, have been pressing for improvements. The Council was persuaded to change it’s mind and make Tarves park amongst others, a priority when spending became available. The work will take a week to 10 days.